INTRODUCTION TO SUSTAINABLE SITES is a statewide, section by section, event hosted by the NC Chapter of the American Society of Landscape Architects in partnership with the US Green Building Council, ASLA, and the NC State & NC A&T University Landscape Architecture Departments. The Triangle Section event will be hosted at NC State University’s renovated Talley Student Center, which is double-LEED Gold certified. There will be a core Introduction to Sustainable Sites presentation, followed by presentations from Emily McCoy, PLA, SITES AP and the NCSU MLA Design+Build Studio. 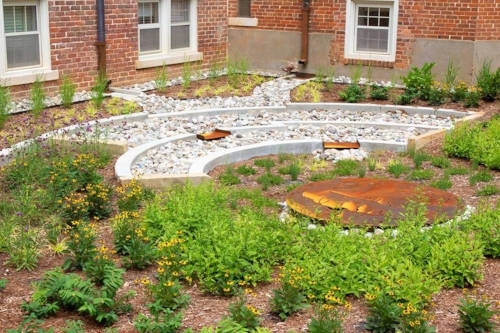 There will be an exclusive tour of the LID stormwater retrofits transforming the campus. The event will conclude with a studio networking reception hosted by SASLA. FREE for students, with limited seats available. Tour will end with SASLA Student Reception.